Composite view of Titan built with Cassini images taken on Oct. 9 and Oct. 25, 2006. If life does exist on Saturn?s intriguing moon Titan, itprobably stinks. The icy moon has long been seen as a potential spot forextraterrestrial life, but so far, there?s no evidence of any living thingsthere. 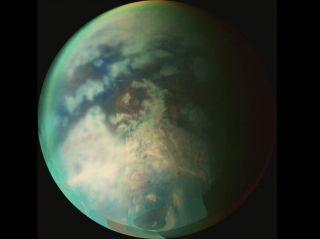 And if there were life on Titan, it would likely involvechemicals that are noxious and disgusting to humans, scientists say. "This idea that you can walk up to the alien ambassadorand shake their hand is very unlikely," said biochemist William Bains ofMIT and the Cambridge, England-based Rufus Scientific. He explained that theseother worldly life forms would probably be so foreign to us that it might bedifficult to recognize them as life, and coming into contact with them couldprove hazardous. For example, Titanlife's metabolism might involve chemical compounds such as phosphine and hydrogensulfide, which are both foul-smelling gases that are toxic to humans. "They're truly horrible chemicals ? to us," Bainstold SPACE.com. "But if this sort of life did exist our sort of chemistrywould be dangerous and reactive to them." Titan is a world very different from Earth. About twice aslarge as our moon, Titan is Saturn'slargest satellite. It has a thick atmosphere of orange smog made mostly ofnitrogen. Because it is about ten times as far from the sun as Earth, Titanis freezing, with a surface temperature of minus 292 degrees Fahrenheit (minus180 degrees Celsius). At this temperature, water is permanently frozen solid.However, Titan is home to abundant liquid lakes of methane and ethane, whichsome scientists think could host alternative forms of life. To research what life might be possible on this strangeworld, Bains and other scientists are testing which types of compounds woulddissolve in methane and ethane, and they are using computational models to tryto predict possible patterns of biochemistryon Titan. "I've taken Titan as an example of a pretty extremeenvironment where clearly terrestrial biochemistry isn?t going to work,"Bains said. "Life anywhere else that is radically different from earth isdifficult to get your head around." Instead of relying on water as a primary ingredient forlife, as Earthlings do, Titan's life might have blood based on liquid methane,Bains said. Such a creature couldn't survive on Earth, where methane is a gasat our warmer temperatures. "Their blood would instantly boil then release thisgreat cloud of chemicals, quite a number of which are quite poisonous,"Bains said. And instead of using the element carbon to build many of themolecules that make up life, these creatures' chemistry might be based onsilicon. While this element is relatively flexible and able to bond with a widevariety of other elements, many of these bonds would be unstable. For example,some compounds that could be present in Titan life would spontaneously burstinto flames if exposed to Earth's air. Ultimately, scientists don't even know whetherextraterrestrial life on Titan, or anywhere else in the universe for thatmatter, is even possible. But Bains said it's useful to research some of thesequestions so we might know what to look for, and understand more about thepossibilities for life. "I'm always hesitate to overstate how likely this sortof weird life is," Bains said. "But we have not yet ruled itout." Bains plans to present his research at the RoyalAstronomical Society's National Astronomy Meeting, which begins on Monday atthe University of Glasgow in Scotland.